I've been using Lush's solid shampoo bars for months now, but I'm now trying out of Garnier Fructis' new lines, Hydra Recharge*. My hair is wavy/curly, and is quite dry and damaged from years of heat damage. In the past year or two, I've really made a conscious decision to stop using heat on my hair. Now I only use heat on my hair about once a month, which I'm really proud of! However, my hair is still on the mend, so I always try to find products that are hydrating and smoothing. "Want lasting hydration without heaviness? Fructis Hydra Recharge is enriched with superfruits of goji berry, passion fruit and kiwi, for high performance hydration without the weigh down. Hair is weightlessly silky & soft for up to 2 days!" The Hydra Recharge Shampoo is the "1st innovative shampoo with encapsulated beads of superfruit goji berry + passion fruit and kiwi". You can actually feel the beads in this shampoo. The formula feels like a gel with beads, but once you work the shampoo into your hair the beads burst, and the shampoo lathers up very well. The Hydra Recharge Conditioner is light blue in colour, and is a medium thickness. I find that this conditioner really helps to keep my hair feeling soft and moisturized. This formula also doesn't weigh down my hair, although I haven't really found any product that weighs down my hair. My hair is very thick, wavy, and I do tend to have quite a bit of natural volume. But, if you have thin hair, I think this conditioner would be great, as it's very hydrating without making hair look limp. 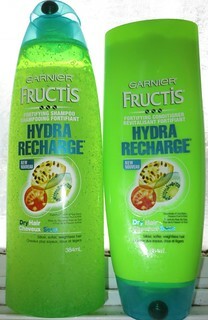 Overall, I am really enjoying this new shampoo and conditioner from Garnier Fructis! My hair is left soft and manageable after each shower, which I'm not going to complain about. This line also includes a 1-Minute Moisture Treatment, which I'm really wanting to try out. I really like some of the Garnier styling products but haven't really loved their shampoo's and conditioners. Great review!! I have found most of their shampoos leave my hair quite oily, but this specific one didn't! I haven't tried much from Garnier, but I'll have to pick this up next time I'm browsing the shampoo aisles. I have been using the Garnier Moroccan oil for the past few months, and I really love it. I'm really wanting to try out their Moroccan Oil, it sounds great!